Compact Series evaporators are designed for very small cellar spaces, typically under stairs, pantries and large closet spaces. These evaporators are mounted on the wall or between studs, with the air blowing directly out of the top and front of the unit. This unit can be easily concealed with integrated racking due to its small size. 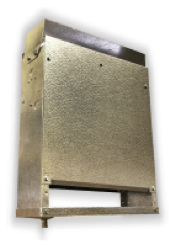 Streamline Series evaporators are designed for compact cooling with single and dual fan options, based on size. This unit should be installed near a wall and is designed to pull air from below and blow cooled air across the cellar. This unit can often be integrated with custom racking for a cleaner look. This coil should be installed in an area that will allow the air to blow across a cellar in its longest direction. 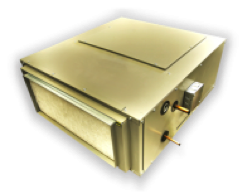 This coil is designed for very small to medium sized cellars. 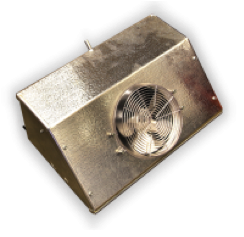 The Ducted Series systems use only the finest commercial grade air handlers available and are outfitted with rust proof aluminum plenums. These units are virtually silent and are only noticeable in the cellar by the grills attached to the ductwork. These are perfect for cellars with crawl space below, attic space above or an adjacent room where the air handler can be mounted and ducted into the cellar. Often, custom wood grills can be made to match the racking, or the ducts can be well hidden for minimal visual presence in the cellar. Available in both Horizontal and Vertical systems based on mounting requirements.